The first full image of Doom from the upcoming Fantastic Four movie has come out thanks to a new trailer t hat blends old and new footage. It’s definitely….umm… interesting, to say the least. Victor Von Doom is a beloved character by many comic readers, and it seems like the new Fantastic Four film will once again miss the mark with the physical look of the character. In the old F4 movies, Doom physically looked closer to the comics version with a deformed face and metal mask. I think that the costume of the old Doom was pretty boring and could have been much cooler. However, when seeing the recently released photo of what the new movie’s Dr. Doom will look like, it has me worried. I’ve actually been quite excited for the reboot of Fantastic Four; I’m a big fan of Miles Teller, Michael B. Jordan and Kate Mara. Jamie Bell wouldn’t be my first choice for The Thing, but I can’t say anything super negative about his casting. All of that was good, I liked what I was seeing from the trailers for this movie and actually felt good about it’s release and that someone might have finally gotten Fantastic Four right. Yet, this new Doom photo has me somewhat worried once more. There have been multiple designs of Doom throughout the years, and it seems like 20th Century Fox has chosen to model their reboot version off of the Ultimate Universe version. That version of Doom, as you can see to the left, had a completely altered body like the picture above. The new movie version would definitely not be my first choice because I think it just looks too modern. I would love to see the traditional version of Doom, but if this can logically fit for the new film, I won’t hate it. I’m a fan of Toby Kebbell from Rock N’ Rolla and Black Mirror so I’m hoping this can be another successful role for him. If his performance is good enough, it will make it easier to get over the look if you aren’t a fan. The new Fantastic Four movie is set to release on August 7th of this year. I don’t have high expectations for this movie, but I’m hoping it can at least manage to be above average. The cast is solid, Trank is a solid director that will hopefully be able to transition what he did with Chronicle to t his. Everyone is extremely excited to see Spider-Man finally coming back home and joining the MCU. News continues to pour out about the character and his solo film; we know that Spidey will make his first official appearance in next years, Captain America: Civil War and young 19 year old actor, Tom Holland, will be portraying the character. Some interesting information has now released that provides some very minor details about the solo Spider-Man film that is scheduled for a 2017 release. During interviews at a screening for Ant-Man, Kevin Feige said that Spider-Man’s solo film would be comparable to a John Hughes coming of age film. Hughes created some of the 80’s best films in classics such as Ferris Bueller’s Day Off, Home Alone, The Breakfast Club, as well as tons more. Personally, I think this is a good thing to hear. A large part of Spider-Man as a character is watching him grow into adulthood while having to manage being a hero on top of it. Marvel is making a smart decision to have this movie not be a complete origin story but I really am glad to see how much emphasis they want to put on the character to really build him. Marvel is really nailing their characters and crafting the movies around that, which makes them feel unique and less generic for “just the superhero movie for this year.” I think that Spider-Man will be a huge hit because while he is one of the most universally loved characters, there is a rich background of story-telling if done right. Civil War will be a huge way to introduce the character because in the comics, this is a situation that really defines who Peter is as a person. I’m really looking forward to Spider-Man and think that it will be a huge success. I really like Tom Holland for Peter and think that Marvel’s input will finally give us a stable and proper representation of Spider-Man on the big screen. The summer movie season is in full swing now, and it’s been great thus far. Coming into 2015, we all knew there was plenty to be excited for, but now that so many hits are delivering, this year is really turning out to be a phenomenal one. Of course there were the guaranteed winners like Avengers: Age of Ultron and Pitch Perfect 2, but when it comes to blockbuster action or comedy flicks, it’s always a 50/50 chance for success. In 2015, Furious 7 kicked things off in the Spring with huge box office numbers and a really fun installment to the franchise. More recently, movies like Jurassic World and Mad Max: Fury Road have returned to famous franchises from the past and re-established why we loved them so much. Even something along the lines of Spy was a really nice comedic surprise when it could have been a horrific flop. I don’t even need to talk about Pixar’s Inside Out. Even when you dig deeper into the indie scene there have been great releases like Ex Machina, Dope and Me, Earl and the Dying Girl. It’s just a great year for movies, and we’re only at the halfway mark. As we look forward to the upcoming months, there are still tons of great films that I’m itching to see, but right now we’re just going to stick to July alone. These are the five movies I’m looking forward to the most in July. Trainwreck is my wildcard for July. The fifth movie has honestly been a Russian roulette for me; I would have filled this spot with Terminator Genisys but they decided to reveal most of the movie and a major plot twist in the previews which has me disappointed and bitter. I think Minions looks cute but not sure it is worthy of the spot, especially after seeing what Inside Out accomplished. I hadn’t heard of Self/Less until maybe two weeks ago and am somewhat intrigued by it, but can’t say it’s really drawing me in or that I’ll check it out in theaters. So what does this leave us with? Trainwreck. I’ll be honest, I have yet to be fully pulled in to the recent Amy Schumer craze, but I don’t dislike her. Luckily for everyone, I love Judd Apatow and Bill Hader. This movie has tons of potential, and I’m willing to take a chance on it. Usually, Apatow knows how to deliver a great story that has great comedy but knows how to be honest and real with its story and emotion. I’m hoping that he finds another winner with Trainwreck and it’s on my list because it has me curious enough to go check it out one night. It’s been a great summer for action movies. I honestly can’t think of one that has been a let down up to this point. When you prepare to watch an action movie, you just have to remind yourself that story and realness might not be an applicable thing to judge by. When I go to watch a Fast & Furious movie, I’m preparing to watch some ridiculous but fun action that involves cars and the characters I grew up with. Luckily though, Mission: Impossible nails action with a solid story. While I will be honest, I need to refresh myself with the series (I plan on watching all of the movies before this one) they have never let down. Although Tom Cruise isn’t my favorite actor, I can always trust he will deliver when it comes to Mission: Impossible films. The next chapter in the franchise; Rogue Nation focuses on Ethan Hunt and his team coming together for what might be their last mission as they attempt to take down the rogue spy group called The Syndicate. I’ve always felt like the MI films really wanted to be the American version of James Bond, but went too far with the action side of things; however, the movies have completely embraced what the people want and haven’t changed, which is why they find so much success. Considering how well Ghost Protocol did and is rated, I have no doubts that Rogue Nation will be awesome. Southpaw stars Jake Gyllenhaal as a hot head boxer named Billy “The Great” Hope, who is reigning Junior Middleweight Boxing Champion of the World. One night his temper gets the best of him when he runs into an opponent that begins to crudely trash talk him and the situation ends with his wife being killed. When Hope seems to hit rock bottom, he finds a drive, determination and fire that he’s never had before. Jake Gyllenhaal is one of my favorite actors and when you look at his resume, he knows how to select a good role. Southpaw looks like a gritty and emotional story that will hit your emotions and give you something to route for. I imagine this will be another great performance from Gyllenhaal and am hoping to see something written by Kurt Sutter that feels more like the first couple seasons of Sons of Anarchy rather than the more recent ones that have just finished up. I bet a lot of people are amazed this wasn’t number one. It’s no secret, I’m a Marvel junkie, an I am beyond pumped for the next installment of their cinematic universe. While I enjoyed Age of Ultron a ton, I definitely left the theater feeling somewhat unfulfilled. I love everything that Marvel is building and think it’s awesome that they are incorporating so many heroes. Although Ant-Man is someone I’m slightly less familiar with (although I have read plenty of stories including the character), I think that this will be a Marvel movie comparable to my favorite comic, characters and movie, Guardians of the Galaxy. Guardians was the first natural feeling Marvel movie since Iron Man where the character and style perfectly meshed with what the movies are aiming to accomplish. Although The Avengers and Captain America: The Winter Soldier round out my top three Marvel films, I believe that Ant-Man has the ability to be something surprisingly satisfying. From the looks of the trailers it seems like Paul Rudd is another perfectly chosen actor for the role (which I always thought he would be) and that Marvel has nailed the tone that Ant-Man needs as a character. While I’m easily more excited for next year’s Civil War story finally moving to the screen because it will incorporate most of the superheroes, I am more excited for the Ant-Man origin than I was for AoU. I’ve been waiting to check out this movie ever since I heard about it. The End of the Tour is a movie about a five day interview between a Rolling Stone Reporter named David Lipsky (played by Jesse Eisenberg) and famous novelist David Foster Wallace (Jason Segel). The story takes place during 1996 just after the release of Wallace’s most known piece, Infinite Jest. The movie focuses on the relationship that forms between the two men and how their views on life impact one another. I think I’m really hyped up for this because of Jason Segel. Segel is obviously known for his comedic roles, but it will be really nice to see him step into something that is this serious. From what I’ve read, people are really impressed with Segel’s performance down to the little body movements he makes. We know that Eisenberg is a solid actor and can pull off both serious and relaxed roles, but I have a good feeling that these two on screen will deliver a fantastic film. Marvel’s Daredevil is extremely close to releasing on Netflix and is exactly one month away from today. The full official trailer was released today to give a longer look at the show. There have been some teasers released over the past month but this two minute collection of clips really shows how awesome the show looks. It’s clear that these Netflix shows are going to reveal a darker side of Marvel, especially with the announcement that Luke Cage will really be aimed towards an adult audience, but the new Daredevil trailer gives off a feel completely different from everything else Marvel has produced so far. The cast that has been put together for this show is pretty fantastic and this full trailer only backs that up. The trailer has found a way to make me even more excited than I previously was about the show and April 10th really can’t get here faster. San Diego Comic Con is the place to announce and reveal anything relating to superheroes in any form, and in the past decade it has been the exclusive place to learn new info about all of the upcoming DC and Marvel films. Marvel’s Guardians of the Galaxy director James Gunn announced today that the company wouldn’t be appearing at SDCC this year, which is a huge disappointment to fans. While it makes sense for Marvel to save all of their reveals for the D23 Disney expo later on in the year, Comic-Con has always been the place to go for all of the reveals. 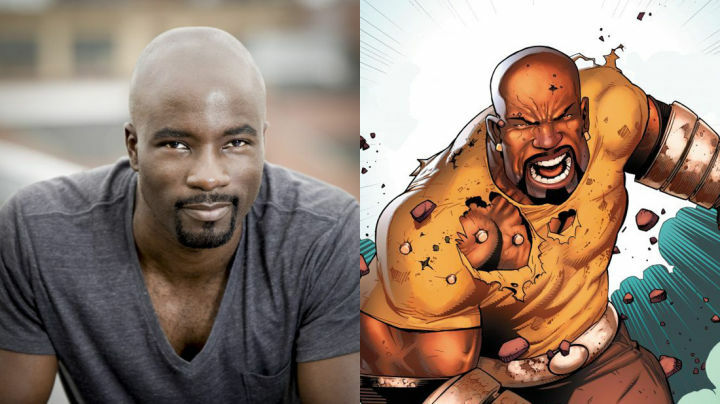 Luke Cage is set up to be the third show released in the Marvel and Netflix Defenders plan behind Daredevil, which premieres in April, and Jessica Jones which could possibly hit the streaming service in the Fall. All of these shows are going to be dark and pretty gritty with Netflix having less restrictions but apparently Luke Cage will really be aiming to please the adult market with something action packed and dark. Cage is a great character with a lot of good background and depth to him, so the show should be really fun and awesome to watch, especially if he’s knocking people around pretty ruthlessly with his power fists.